I think Katie Egeland, who has a wonderful blog about knitting and other adventures called If Time Exists, got tired of me swooning over felted bowls on Etsy and recently wrote in encouraging me to try felting a bowl myself. "Any natural animal fiber will work for felting. Wool is the most commonly used material and will give you nice results for a felted bowl. Just make sure the wool hasn't been treated to be machine washable (called 'superwash'), because then it won't felt. You can use any weight of wool, though bulkier wools will make a thicker, sturdier bowl. You'll need needles that are a few sizes bigger than normally recommended for the yarn you're using. For the bowl pictured above, I used Freedom Wool (a bulky weight) and size 15 needles. You'll be using 16-inch circular needles as well as double-pointed needles in the same size. You'll need to know how to cast on, make a knit stitch, knit in the round, knit on double-pointed needles, and decrease your stitches using 'ssk' (slip slip knit) and 'k2tog' (knitting two stitches together). If you're unfamiliar with some of these techniques or with using different types of needles, check out Knitting Help, which has tons of free, helpful, step-by-step videos that will bring you up to speed. Cast on 45 stitches using your circular needles. Join and work in the round. Don't turn the work -- simply knit the stitches in a circle, creating a tube as you go. Knit until the tube is six or seven inches long. If you want a deeper bowl, continue knitting until your tube is a little longer. Keep in mind that the felting process shrinks the fabric more length-wise than it does width-wise. Round 1: *ssk, k5, k2tog. Repeat from * to end. 35 stitches remain. Round 3: *ssk, k3, k2tog. Repeat from * to end. 25 stitches remain. Now switch to your double-pointed needles. Put ten stitches on the first needle, five on the second, and ten on the third. Use the fourth to knit stitches off of each needle (one at a time). Round 5: *ssk, k1, k2tog. Repeat from * to end. 15 stitches remain. Round 6: K2tog 7 times, k1. 8 stitches remain. Cut yarn and thread through remaining stitches with a tapestry needle. Tighten and weave in ends. Now you're ready to felt! The keys to felting are agitation and hot water. You can felt in the washing machine -- Knitty has a really good article about how to do that. But I live in an apartment building with coin washers, so I felt by hand in the sink. Start by filling the sink about halfway with really hot water, adding a little dish or laundry detergent. I wear rubber gloves so I don't destroy my hands. Then have at it! Swirl your bowl around, rub it, squeeze it, beat it up. Sometimes I use a wooden spoon for variety. Just be really rough with it. You'll know the felting has started when the wool begins to fuzz up and blur the stitches. Periodically during the process, fill a bowl with ice cubes and cold water and soak the knitting in there for a minute. Then refill your sink with fresh hot water. The drastic temperature changes help the felting along. It usually takes at least a good half hour of work to felt a piece of knitting to the point I like for a bowl. The more you felt, the less visible the stitches and the stiffer the resulting material will be. When you're happy with the amount that your bowl has felted, squeeze out the excess water without twisting. Roll the bowl up in a towel and step on it to get more of the water out. Then take it out and stretch it into shape over an upside-down bowl. 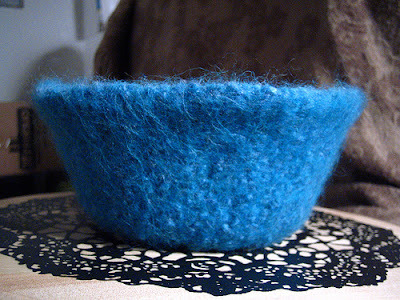 Leave it to dry -- and voila, a felted bowl!" 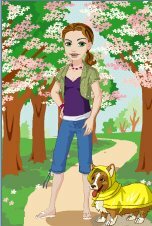 Thanks so much, Katie! I need to head over to Knitting Help (which really is an awesome site for beginning knitters like me) to study up on those decreasing techniques, but I'm definitely going to attempt this. 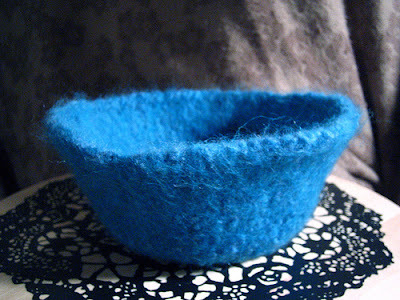 And if any of you try your hand at a felted bowl, please let me know how it goes! Thanks Leah, it looks great! And let me know if you have any trouble. Thanks for the post! You guys inspired me to try out one of my own...you can see it on my blog if you like! Thanks so much for the instructions! I just saw these online and was looking for the how to. They would make great gifts and are very unique.